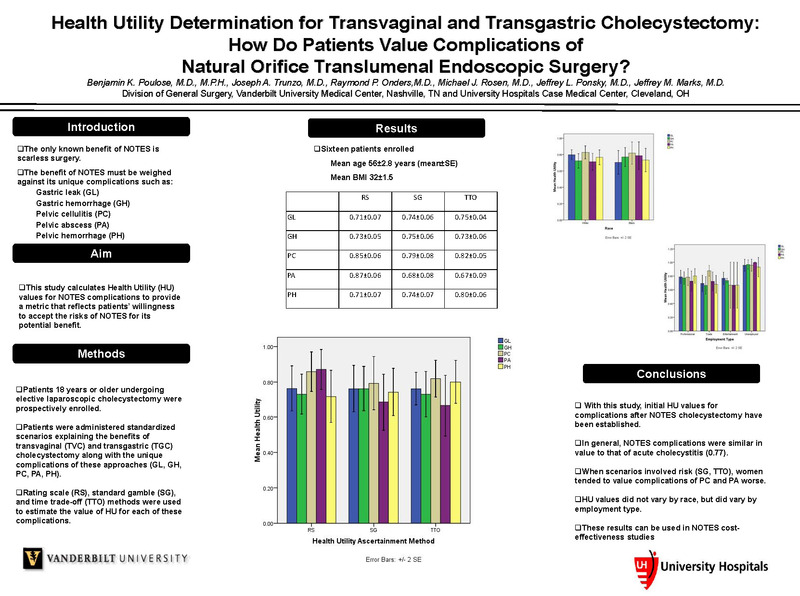 Health Utility Determination for Transvaginal and Transgastric Cholecystectomy: How Do Patients Value Complications of Natural Orifice Translumenal Endoscopic Surgery? Introduction: Critical to the evaluation of NOTES procedures is the perceived benefit of scarless surgery weighed against its unique complications such as gastric leak (GL), gastric hemorrhage (GH), pelvic cellulitis (PC), pelvic abscess (PA) and pelvic hemorrhage (PH). The goal of this study was to calculate health utility (HU) values for these complications, to provide a metric that reflects patients’ willingness to accept the risks of NOTES cholecystectomy for its potential benefits. HU evaluations are not surveys but are tools based in utility theory that provide a quality of life measure that is comparable across disease states. HU are valued on a scale of 0 (state equivalent to death) to 1 (state of perfect health). For comparison, the published HU of patients with acute cholecystitis is 0.77. Methods: Patients with symptomatic cholelithiasis were prospectively enrolled in the study. Patients were administered standardized scenarios explaining the potential benefits of transvaginal (TVC) and transgastric (TGC)cholecystectomy along with the unique complications of these approaches and the management involved (GL, GH, PC, PA, PH). Rating scale (RS), standard gamble (SG), and time trade-off (TTO) methods were used to determine the value of HU for each of these complications. Results: Sixteen patients (81% women, 69% Caucasian) were evaluated with a mean age of 56±2.8 years (mean±standard error) and mean body mass index of 32±1.5. HU values for all NOTES complications ranged from 0.71-0.89. Data are summarized in the table. Conclusion: With this study, initial HU values for complications after NOTES cholecystectomy have been established. In general, NOTES complications were similar in value to that of acute cholecystitis. When scenarios involved risk (SG, TTO), women tended to value complications of PC and PA worse. These results can be used to compare how patients value these unique complications with other known disease states and can be used to perform cost-effectiveness analyses to evaluate NOTES procedures.